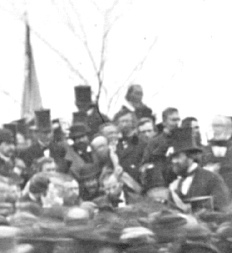 November 1863 Lincoln is to speak at the dedication of a National Cemetery at Gettysburg. It was not until 1952 when Josephine Cobb of the Still Pictures Branch National Gallery recognized Lincoln at the center of the indicated square, probably about noon, just after Lincoln arrived. Study of these prints reveal some remarkable details. To obtain this detail I scanned a print made from the original negative. Reading from Carl Sandburg's Lincoln "There was only an itinerant photographer available for Mr. Lincoln's speech.....Lincoln's speech was so short the Camera Man missed it." I think he is just sitting down. It is obvious that few are paying any attention, or could hear what was said. Look at the full sized image. How many knew the import of what was being said that day. See full sized image No sound amplification, who was paying much attention? Pat and I decided to make an auto trip to several Brady collection locations to see if I could locate where some of the photos were taken. First to Gettysburg. I wandered about wondering if the stand of trees in back could be the same small tree behind Lincoln. I followed the slope of the hill to match the photo This looked like it.